Born in St. Petersburg, the 20th century choreographer thrived abroad. He described himself and his fellow choreographers as “a silent minority” that could dance. After he moved to America, Balanchine tailored his ballets toward viewers who had never seen a ballet but were eager to fall in love with the art form. Balanchine was born in St. Petersburg in 1904 and like the rest of his generation was confronted by the turmoil of the early 20th century. But while many of his contemporaries became figures of genius in the West, Balanchine’s aim in life was to derive enjoyment from it, as if suffering did not touch him at all. And in doing so, he turned his life into the equivalent of art. Watch the company perform Balanchine’s “Walpurgisnacht Ballet” and “Emeralds,” while marking the 400th anniversary season of Shakespeare’s death. Nov. 28, 2015 - Jan. 3, 2016. Today, the journey of “Mr. B,” as he is respectfully and admiringly known in America, seems a smooth and direct ascent. But in reality, Balanchine’s rise to fame could be described as a succession of accidents. It was only by chance that Balanchine enrolled at the Mariinsky Theater ballet school. His parents dreamed of a navy career for their son, but missed the deadline to submit an application to a maritime college. Balanchine quickly rose through the ranks and graduated from ballet school at the top of his class. Unfortunately, his short height meant that lead romantic parts in classical ballets were outside his reach. But critics wrote glowing reviews of his appearances even in the smallest parts, while fellow dancers recognized him as the leader of the Young Ballet group, for which he created his first productions in the early 1920s. During a 1924 tour of Germany, Balanchine and several other Soviet dancers decided to remain in Europe. Balanchine soon found himself in Paris, where theater producer Sergei Diaghilev invited him to join the Ballets Russes as a choreographer. It was Diaghilev who turned Giorgi Balanchivadze into George Balanchine, although dropping the hard-to-pronounce Georgian surname turned out to be the easiest part of the transformation. Recognizing a choreographer’s talent in the young dancer, Diaghilev set about educating the young man’s taste. His efforts paid off with Balanchine’s ballets “Apollon Musagète” (1928) and “Prodigal Son” (1929). But these triumphs proved to be the last hurrahs of the Ballets Russes. In 1929, Diaghilev’s sudden death cut short Balanchine’s meteoric rise. After working with outstanding composers – Stravinsky, Prokofiev – the choreographer found he now had to agree to any work available. It was then that he met young arts patron Lincoln Kirstein. “I am ready to stake my life on his talent… He can create a miracle and it will happen in front of our very eyes,” wrote Kirstein, who would become Balanchine’s American patron. Balanchine wrote the ballet for the first public performance of his pupils, who had just learned the ABCs of ballet. Professionals are still at a loss to explain how he ended up crafting a masterpiece. 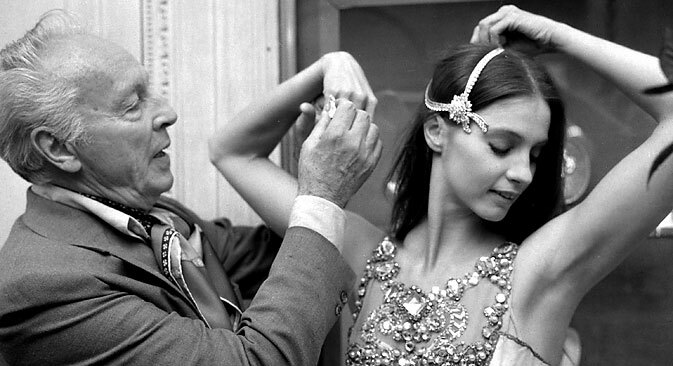 During his first 10 years in the U.S. Balanchine worked in Hollywood, on Broadway and with the Metropolitan Opera. Out of financial necessity, working at fantastic speeds with liberal self-citing, he created a total of 425 opuses, which contrary to his own forecasts are still performed by all the major ballet companies, all over the world. Ballanchine created ballets right up until his death in April 1983. Now, nearly 50 years after his death, Russian theater companies compete to have the most Ballanchine ballets in their repertoire, and Ballanchine’s dream has come true: Audiences are now able to experience the refined beauty of his ballets – without interpretation. More U.S.-Russia stories in your box!